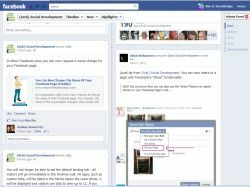 Today Facebook announced that that timeline layout was coming for Facebook pages on March 30, 2012. We knew this was coming but until today we didn’t have many details. Facebook’s announcement page didn’t include specific information about what this would mean for those of us who have created custom tabs using iframes so I dug through the Help file a bit and found answers to my most pressing questions. Recently I reviewed a lot of custom Facebook pages for my PC World article, 14 Creative Ways to Use Facebook Pages. I found a couple of problems with a number of pages that need to be addressed or hopefully the page owners pan to resolve. These issues relate to the deprecation of Static FBML and the SSL requirement that was implemented October 2011.